There is free wireless available at some locations in Rome, but it's not as straightforward as one might hope. The city wifi is called Roma Wireless. In order to sign up for an account, you must provide a valid Italian cellphone (mobile) number. (I can't imagine many scenarios where you could use a fixed line number.) The phone number will be your account number. In order to activate the account and get your password, you must first call an automatic validation number. There is no option to enter non-Italian numbers, and there is no way to get a password without calling the validation number. You have about five minutes after account creation in order to validate the account, otherwise I assume the account expires and you would have to re-register. I had an Italian number as I got an Italy SIM (TIM network) from Roam Simple before I left. NOTE: Make sure you have an unlocked phone that supports the right GSM bands in order to use this SIM. Once your account is validated, you can log in at any of the hotspots and get one hour of free wireless per session. I found that after the session expired, you could login again and get another hour. You can only login from one device at a time. I had a lot of trouble using Yahoo properties (Yahoo Mail, Flickr) and Facebook with the service, it seems there is something about the https secure login for Yahoo that Roma Wireless doesn't like. I had no problem using Google sites (gmail, picasaweb). I initially used the hotspot in Piazza di Spagna (Spanish Steps) but I don't recommend this as it is crowded, noisy, there is very little shade and it's not that comfortable to sit there for very long. I found there are tons of hotspots in the Villa Borghese park. 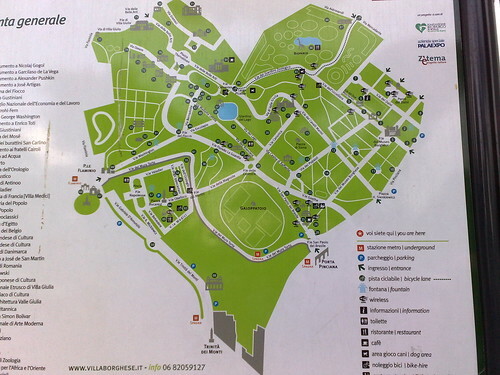 There are maps at some of the park entrances that clearly show where the hotspots are (look for the wifi logos - click the image below for a larger version). 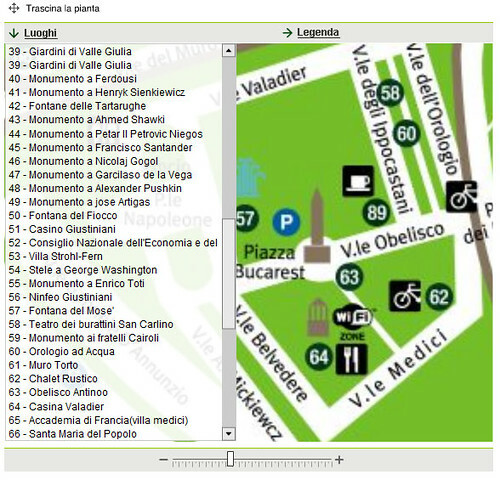 This same information is also available in the online interactive Villa Borghese map, but I can't get the map to work in anything other that IE on Windows, even though it appears to just be regular Flash. It would be really useful if they would provide the map as just an image as well. I sat in the shade on a park bench just beyond the Pincio terrace, I was sitting in behind the Casina Valadier (outside, not inside the building gates). Strong signal. Very pleasant. Here's a screenshot of that location. The Roma Wireless service is actually provided by Unidata (Uniwifi), there's more information on their site. Your account will actually be an @uniwifi.it address. Depending where you login, you may get a Roma Wireless screen or a Uniwifi screen. I think that only the romawireless SSID is free hotspots, there are more locations in the city than that but I don't know if the other locations are also free. I think the Uniwifi site is only in Italian. I wasn't able to find any hotspots in Piazza del Popolo or Piazzale Flaminio. If you don't have an Italian phone number, things are considerably more challenging. The days of open wifi access points (no password) are pretty much gone. Near Piazza del Popolo there are a few cafes I found with wifi, but not many. The only ones I found were pretty fancy - the Adriana Cafe on Vicolo dell'Orto di Napoli off of Via Babuino - it's on the 2nd floor, the access is from di Napoli. and I also saw the TAD Cafe (which I didn't try) at Via del Babuino 53. This was my first time using the iPod Touch as a wifi access device, it worked pretty well, but it has a fairly weak antenna, so you need a good signal. One thing I noticed is many of the apps expect always-on connectivity, so for example if you load up a page in Safari and expect to be able to access the cached version later when you're no longer connected, it won't work (at least I couldn't get it to work) - if you try to access it, it will try to reload the page, find no connection, and just show you a blank page. It is a great portable web surfing device, thin and light, good for searches, maps, Twitter (I use TwitterFon), Facebook, weather and such. I have the 8 GB one. 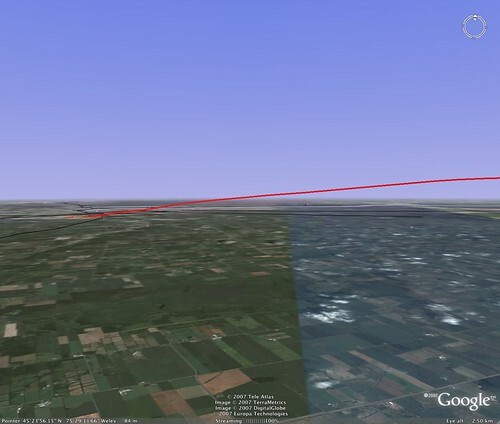 The latest feature for digital cameras: built-in GPS. 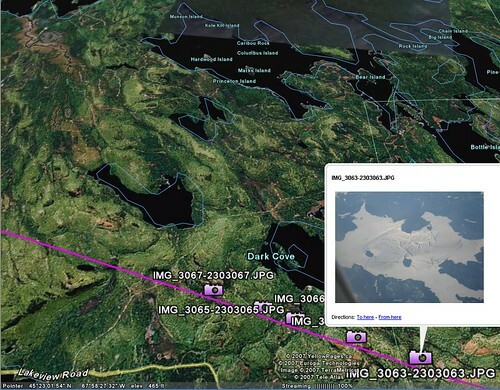 Nikon’s new Coolpix P6000 records the exact location of every picture, so you can post and geo-tag your snapshots on Google Earth. Also taking photo-sharing to the next level, Microsoft’s cutting-edge Photosynth can stitch together photo collections. From Travel + Leisure , 2009 Travel Trends, #6 New Travel Photo Technology. 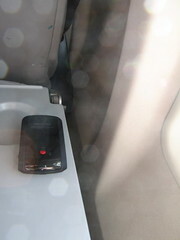 During flight, never use cell phones (to make or receive calls), two-way pagers, radios, TV sets, remote controls (example: DVD, CD, game, or toy remote controls), a cordless computer mouse, commercial TV cameras, or Global Positioning Systems. Here's a shot of a lake. 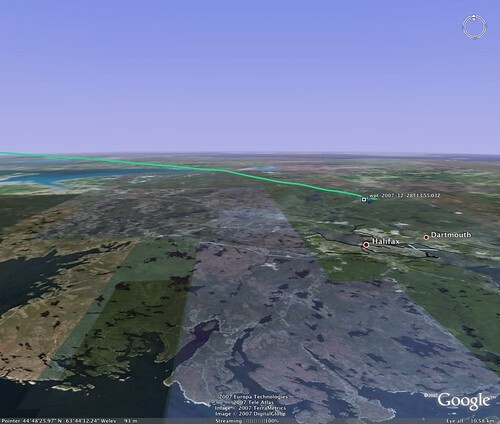 Thanks to Google Earth and Yahoo Maps, I now know that it's West Grand Lake in Maine, with my field of view towards the south-southeast. The two most prominent islands are Hardwood Island and Marks Island. 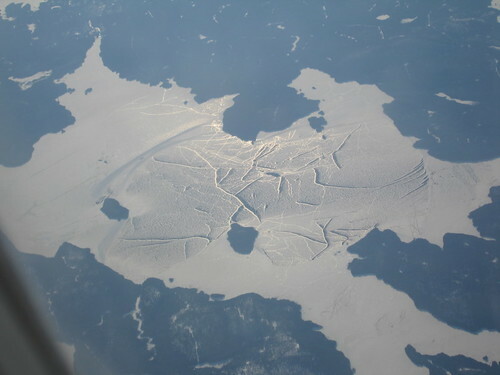 (Err, for those of you not familiar with Maine in December, that's ice on the lake, with big cracks in the ice). 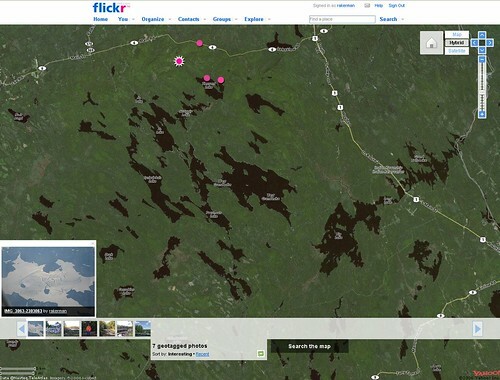 Photos were geocoded with RoboGEO, using data from my Qstarz BT-Q1000. 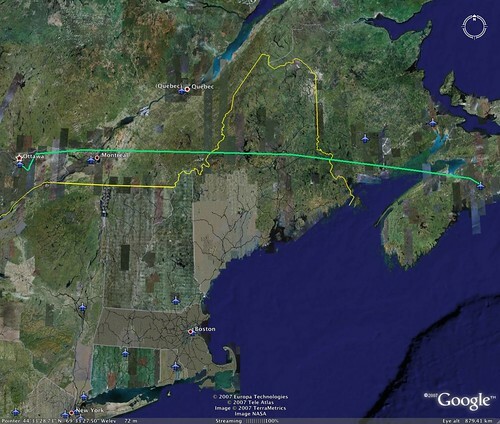 Red track is flight from Ottawa to Halifax. Google Maps view of the track. Google Maps view of this track. 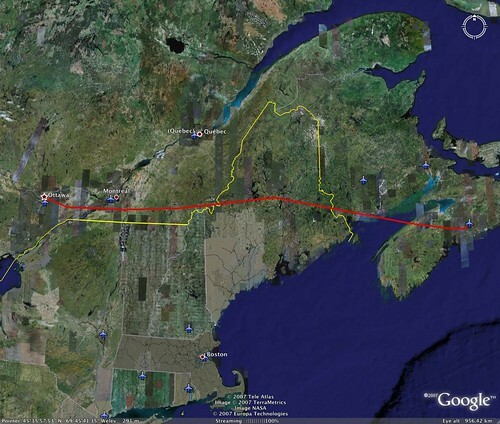 See the reviews list for previous "GPS on a plane" postings. Reminder: DO NOT enable Bluetooth on any device without first checking with flight staff, and Bluetooth is not permitted at all during takeoff and landing (I had the Qstarz in LOG-only mode).